Our water tastes really good now that our bowl is in a new place – we’ve been testing it every 10 minutes so we’re really sure. Mum – I don’t like that noise – but listen, I can make a louder noise – aren’t I clever???? Mummm… don’t you think I’m clever???? No? I do like this big desk Mum, only Neve could fit under that little computer table – I like this one more. There’s plenty of space for a big dog like me. Anyway, she’s too busy guarding Dad’s socks to be bothered about sleeping under here. I’m OK – I’ve got socks. I’ll be fine. I’ll just stay here under the clothes airer and guard Dad’s socks … I’m not too sure about that builder guy. He might want to borrow them. Hey, where have our biscuits gone … oh, out there in the hallway … yep, they’re still there…. Ok they are still there now… yea, they haven’t gone yet …. Alright, they are still safe out there now….. yep…..that builder guy didn’t steal them yet…. It’s alright, they’re still fine …. …. 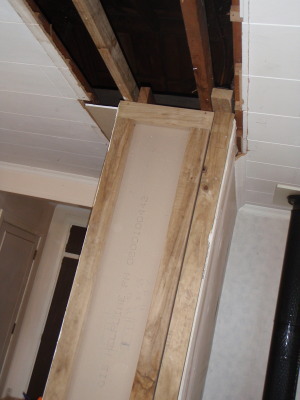 the office needs to be in a state such that people (and dogs and a cat) could function in there is …..
the builder actually arrived today, about half an hour after my previous post. So now we start on round two of our renovations. 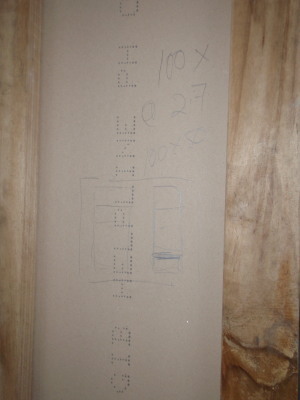 measured some stuff, interrupted me about ten times to ask questions that he mostly had already had the answer to, went away to get some wood, and will be back again bright and early tomorrow morning, and every morning there-after until Christmas. So there goes any plans I had to sleep in from now until Christmas. I possibly have something you want ….. In the quest to restore my craft room/office/storage of teaching resources space into something resembling …. well, I’d setttle for a room where I can actually FIND stuff ….. 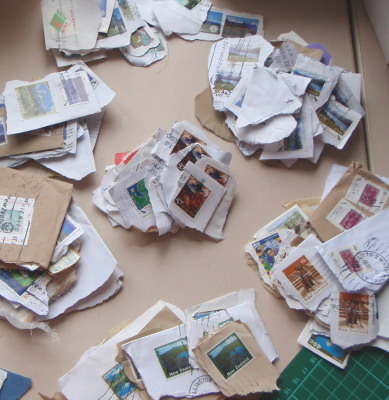 I came across a pile ( hmmmm – truthfully – several piles of )stamps. They used to go to a mission group, but the group doesn’t want them any more. But if you want some of them I’m sure we can come to an arrangement. Because you’ve got something I want –Postcards!!! So here’s what we’ll do. 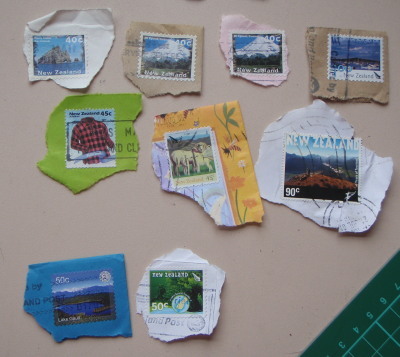 The first five stamp collecting people who leave a comment on my blog telling me that they want stamps will get some of them. 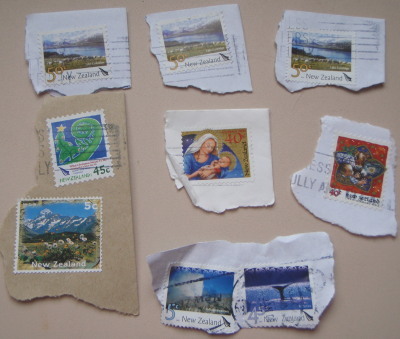 Similar to, but not exactly the same as, the example below — around about 15-16 New Zealand Post stamps of different denominations with a couple of double ups, and a couple from the other random stamp creating companies we have here. What you see is what you get in terms of the sort of condition they are in. Similar (but not exactly the same) assortment to this. me a postcard – linkie here to my Postcrossing profile which explains what kinds I like. 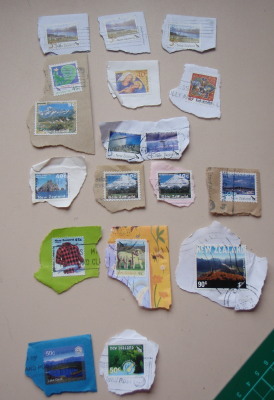 And I will put your stamps in a little plastic baggie (geocachers have lots of those!) and in an envelope, and send them to you! So you’ll also get a bonus stamp or two on the envelope. If this experiment works I will do it again early-ish next year, as I will have more stamps by then due to the iminent arrival of Christmas cards.